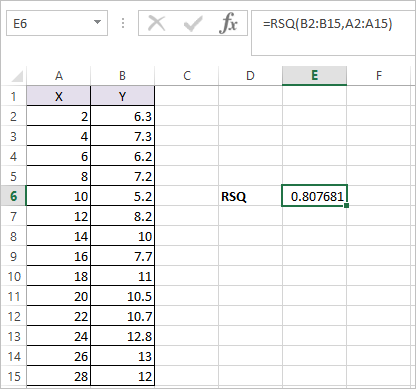 RSQ Function in Excel calculates the R Square i.e. it calculates the square of the Pearson Product-Moment Correlation Coefficient for two supplied sets of values. Where known_y’s and known_x’s are two arrays of numeric values that are of equal length which you want to calculate the R square of. as shown in the above example. This result in the value of 0.807681.